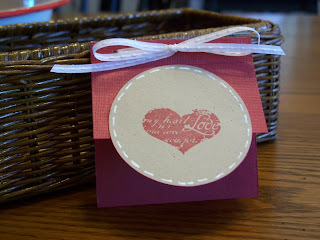 Quick Ideas for Valentines Cards! Here are a couple of new Valentines cards I made today! I was so excited to get my first order from the new catalog this week, I just had to jump in and make something! This first card is just a small 3x3 card. 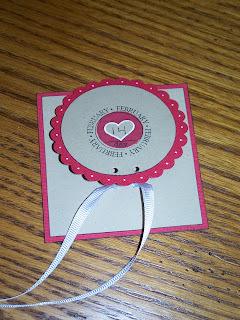 I used Wine Red #2 cardstock and the Kraft Cardstock for the circle. I was so excited to use the new Scor-Pal to make this new card! I scored it in half and then again to make the top where I punched holes to tie the bow. This next card is my favorite! I love the new Date Disks set! I new the minute I saw it, it had a lot of potential uses! One thing I will use them for is to date stamp all my scrapbook pages. I always write a date on them now, so from now on it will just be with a really cute stamp! 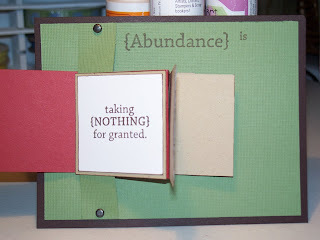 For this card I used my scalloped punch and circle punch. 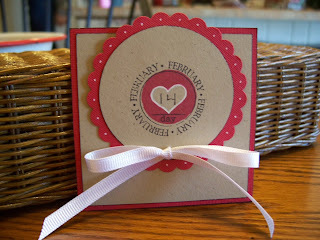 I used the February date stamp but first I used the heart circle from the lovedoodles set. I decorated the edges of the scalloped punch with the new white gel pen! Next, I hinged this piece to a 3 1/2 x 3 1/2 card, punched holes, tied a bow and done! 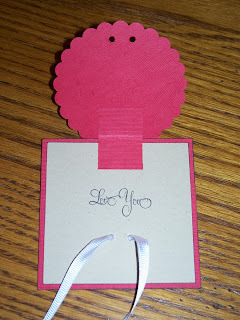 Then I remembered my new "Love You" GWP stamp and had to put inside! So now I can write my own message under the flap or even just sign it! Yeah!! The new catalog is here! There are so many new adorable stamps and paper sets! There are also several new tools and lots of new embellishments! I am hoping to have an open house, like I said in my last post! I will let you know of the date pretty soon! I am going to have a special for January/February! Host a party and get a stamp set for free! Contact me by phone or by email, ll_willison@yahoo.com to get a date set! 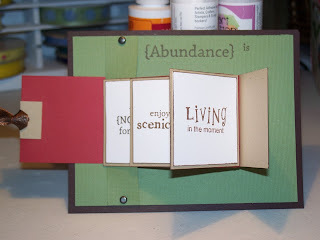 I am going to attach a card that my sister and I made this last weekend. 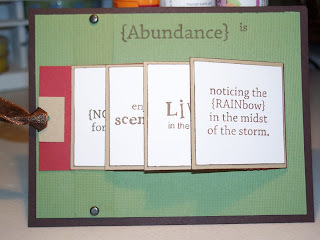 We used the "moreabundace" set and made this waterfall card! If you would like to buy a catalog, give me a call! I have them in stock now and they are $5!